Braces use constant, gentle pressure, applied to your teeth over time, to move them into proper position. While braces are available in a variety of styles, including metal, plastic and ceramic, they all have the same goal: To correctly align your teeth for enhanced aesthetic appeal and for better oral health. 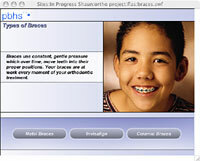 Metal braces are popular with children and teens, and are smaller and more comfortable than ever before. Traditional metal braces feature two main components: the brackets that are placed on each tooth and the arch wire that is threaded through them. As the wire applies pressure to one side of the tooth, the bone on the other side gives way. This causes the tooth to move and new bone to grow behind it. Elastics (rubber bands) are used in conjunction with braces, exerting a constant force to move teeth. Elastics must be worn at all times and changed every day in order to maintain the proper force. Lingual braces work just like traditional metal braces, but are placed behind teeth instead of on the front. This allows them to be completely hidden, so no one knows you are wearing them. Clear braces are a popular choice for adults and teens that would like a discreet alternative to traditional metal braces. Clear ceramic braces use tooth-colored ceramic brackets and wires for a nearly invisible look. 5 out of 5 stars based on 2 Braces reviews. Excellent experience with Dr. Lucey. Always greeted with a smile. She's very clear up front communicating the costs, procedures and timelines. Her office has start of the art technology and has a very comfortable setting. We highly recommend her. Dr. Lucey is an outstanding Orthodontist. she goes above and beyond to make sure the parents and patient are happy with the treatment. She wants us to be happy and my sons teeth perfect. I would recommend her highly. Her work is exceptional.